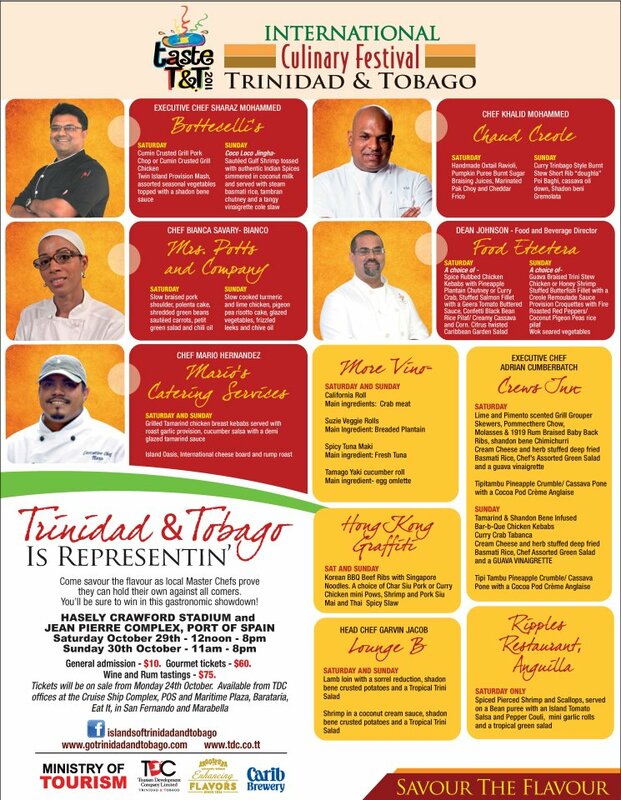 UPDATE (Nov 2) – Check out the photos, videos and newspaper articles for 2011 Taste T&T. Get your taste buds ready for the 2011 TASTE T&T International Culinary Festival, the largest and ‘bess’ festival in Trinidad & Tobago! This year, with the participation of international and regional chefs, the festival has been expanded considerably and guests can feast on the food of France, Mexico, Jamaica, Grenada, Antigua, Anguilla, and of course, sweet Trinidad & Tobago. General Admission Cost is $10. All tasting ticket prices and details are listed below. Gourmet Food Tastings from restaurants including CHAUD CREOLE (St. Ann’s, Trinidad), CREWS INN (Chaguaramas, Trinidad), HONG KONG GRAFFITI (Port of Spain, Trinidad), BOTTICELLI’S (Grand Bazaar, Valsyn, Trinidad) and MORE SUSHI/MORE VINO (Woodbrook, Trinidad). Gourmet tastings are from 3pm to 7pm on Saturday and Sunday. Informative cooking demonstrations, workshops and panel discussions – Cooking demonstrations are all day and will run at 20-30 minute intervals. International & Local Chefs: Taste T&T guests can access award winning chefs like Food Network’s Iron Chef Jose Garces, a judge for the Young Culinarians competition and Master Chef Claus Myer, Denmark’s most famous chef and restaurateur who will conduct a pre-event workshop for culinary students, chefs and other stakeholders on October 24 – 25, 2011. In addition, top chefs from around the world – Mexico (Arturo Mogollon and Manuel Ruelas), Jamaica (Roan Hylton), Anguilla (Glendon Carty), Grenada (Dexter Burris), Antigua (Maurine Bowers) and the United States – will share their culinary expertise and cook up delicious food that showcases our local vegetables and fruits. Taste T&T Workshops for culinary students, chefs and other stakeholders (closed to the general public) will be held from Monday, October 24 – Friday, October 28, 2011. Gourmet Food Tickets are $60 – “When you purchase a $60 Gourmet ticket you get a ‘heavy’ taste/ mini meal portion from any gourmet booth of your choosing (at one restaurant only). Meat and Vegetarian options will be available.” Link to list of participating restaurants & menus for gourmet food tastings (links to a note on Islands of T&T’s Facebook Page). Wine & Rum Tasting Tickets are $75 – “When you purchase a $75 Rum or Wine tasting ticket you get access to one wine or rum tasting session.” Link to wine and rum tasting schedule (links to a note on Islands of T&T’s Facebook Page). Children under age of 10 years are FREE (free admission, tasting tickets will have to purchased)! Street Food will also be sold (cash sales). Food items will include Bake & Shark, Tobago Blue Food, creole meals, doubles, local sweets, coconuts, ice cream, snow cones, etc. Disclaimer: All information listed above is pulled from information published by the Tourism Development Company (TDC). TriniChow encourages you to visit the TDC’s Islands of Trinidad & Tobago Facebook Page for updates on Taste T&T tickets, schedules, participating restaurants, menus, etc. LIKE US on FACEBOOK to keep up with all the news on T&T’s food festivals and restaurant deals, coupons, and promotions. Thanks fot this info. Quite helpful. Called TDC this morning and they said tickets are available @ TDC office in POS and Eat It in Marabella. thanks for this! this is awesome info. what i would like to know is if we have to buy separate chits for each establishment..